Spoken like a true Maroon Five fan. As a closet Pats fan, I rather enjoyed the game, esp. the vegan taco bar and buffet. Apparently, the chicken was (slightly) offensive. Only in California, man. I guarantee that we had WAY more fun here in New Orleans than in lameass Atlanta! What a great day it was! Parades, music and parties all over town. Black & Gold Parade and Boycott Bowl were both a blast and well organized considering it was less than 2 weeks since the Saints lost. Another one of those "only in NOLA" days. Maybe they can get Milli Vanilli to reunite and play next year! They can have Chris Brown to guest if he's not locked up. Hideous horrible,boring game. Only outdone by vile and pernicious halftime non show. UGH! Remind me again...who won? Oh yeah, that's right the PATRIOTS. Incidentally , we all have heard the phrase "window into your soul", small acts reveal insights into one's true personality. I would submit that the act of watching a half-time show, any half-time show, Super Bowl or not reveals much about ones sporting i.q. and genuine interest. Half-time show???? Half-time is when you get refreshments and go to the head and kibbitz with fellow sports fans, not watch some pseudo entertainment. Unless it happens to be some really entertaining marching band. What do the Rams and theSaints have in common? 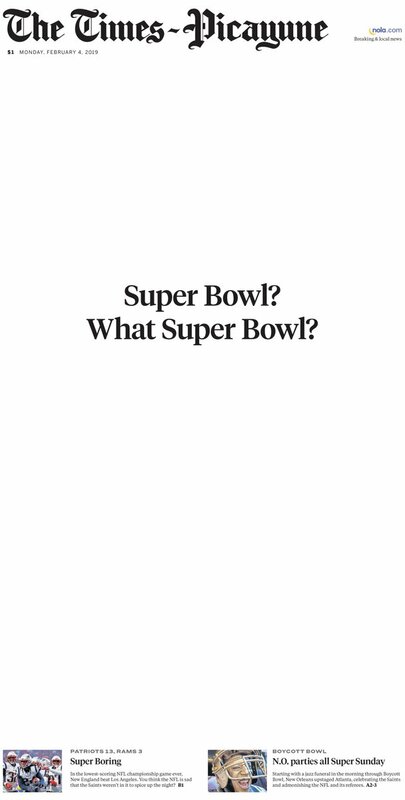 Worst Super Bowl ever ?? It's gotta be up there. The Saints would have put a few more touchdowns up, I'm sure. The last two times my 'teams' were in the big game, the halftime shows were stellar. The Who and Prince.